Receive studies and respond to queries from any networked DICOM device, and store edited studies from any source that can be accessed for future reference and sharing. 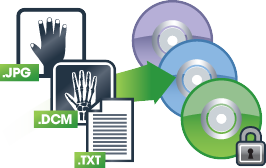 Send studies to any DICOM-conformant archive from within Vertex. Directly and securely share studies with other healthcare facilities using Vertex’s SDS functionality, which conforms to the DICOM TLS industry standard. Burn studies to CD, DVD, and Blu-Ray DISC through Vertex’s support of the industry’s largest selection of autoloaders. Vertex embeds Sorna’s intelligent, easy-to-use viewer on all DISCs automatically. Your existing hardware investment is protected when you switch to Vertex as your software of choice. Rapidly share studies and radiology report results with any physician via email. Distribute medical data to other healthcare facilities through Vertex’s connection with leading suppliers of cloud-sharing solutions.